Krina Panchal is a Head and Neck Physiotherapist with a special interest in TMD, headaches, migraines and chronic pain. She has undergone studies and experience at several prestigious institutions such as The Center for Oral, Facial and Head Pain at Columbia University, Liverpool University where she completed a Masters Module and Alicante, Spain as well as courses with Cranio Facial Therapy Academy. 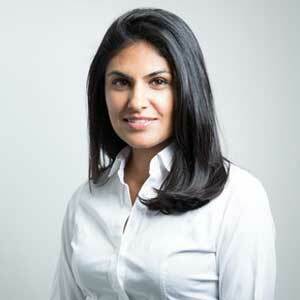 She currently works closely with Professor Piet Haers (Former President of the International Association of Oral and Maxillofacial Surgeons) treating his TMD patients as well as other leading TMD experts in London. She also has a degree in Biomedical Science and a Diploma in Nutrition as well as training in Functional Medicine. Krina uses these disciplines to treat pain through nutrition and lifestyle medicine. Through all this experience she has been able to create an effective multi-faceted approach which is yielding excellent results.